Large o/c (26 x 42 in.) by Stanley Kubicki, dated 1961. Kubicki was a little known New Hampshire artist who painted in a variety of styles in the 1950’s thru 1970’s. This 1961 colorful painting reflects his thoughts on going to the moon, a goal of that had been set in that decade. 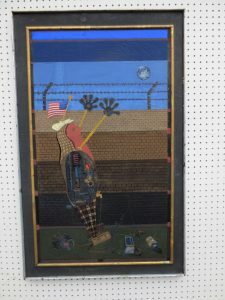 The character is waving good-by to the bad things (note the junk at the bottom of the picture) and earthly constraints as illustrated by the fence, and hoping for the best in the unknown. 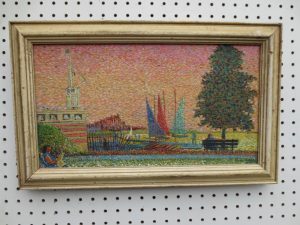 The painting is a part of a collection of his paintings (most of which were signed) found in his house after his death, and purchased from the new owners’ family. 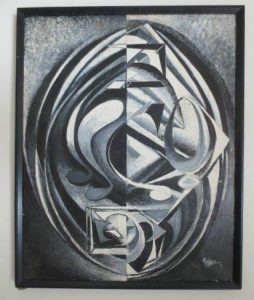 Black, White, Grey modern painting signed Stanley Kubicki, 1955. O/b, 19 x 23-1/2 in. Complex, detailed, intricate, and compelling. Good condition. Kubicki was a little known New Hampshire artist who painted in a variety of styles in the 1950’s thru 1970’s. This painting is a part of a collection of his paintings (most of which were signed) found in his house after his death, and purchased from the new owners’ family. 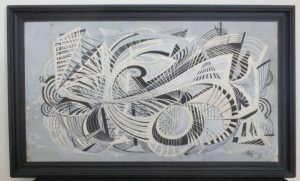 Black, White, Grey modern painting signed Stanley Kubicki, 1955. O/c, 23 x 29 in. Complex, detailed, intricate, and compelling. Good condition. Kubicki was a little known New Hampshire artist who painted in a variety of styles in the 1950’s-1970’s. This painting is a part of a collection of his paintings (most of which were signed) found in his house after his death, and purchased from the new owners’ family. 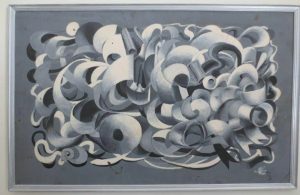 Black, White, Grey abstract painting signed Stanley Kubicki, 1955. O/b, 24 x 42 in. Lots of detail and complexity. Some missing paint and needs cleaning. Kubicki was a little known New Hampshire artist who painted in a variety of styles in the 1950’s thru 1970’s. This painting is a part of a collection of his paintings (most of which were signed) found in his house after his death, and purchased from the new owners’ family. 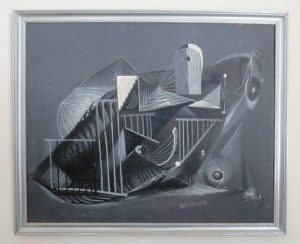 Black, White, Grey abstract painting signed Stanley Kubicki, 1955. O/b, 23 x 38 in. Compelling, attention-getting. Could use cleaning and touch-up. Kubicki was a little known New Hampshire artist who painted in a variety of styles in the 1950’s thru 1970’s. This painting is a part of a collection of his paintings (most of which were signed) found in his house after his death, and purchased from the new owners’ family. Stanley Kubicki, o/c, 14 x 20 inches. Signed Baron Stansilaus Kubicki, Jan 1979. Kubicki, a little known New Hampshire artist, worked in the 1950’s thru 1970’s and painted in a variety of styles. 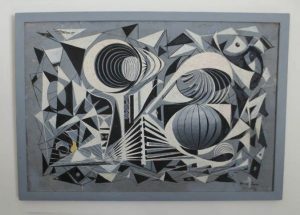 This painting is a part of a collection of his paintings (most of which were signed) found in his house after his death, and purchased from the new owners’ family.This is his last painting known to me (he died in 1988). The signature reflects his sense of humor. Excellent condition. Painted in England. Stanley Kubicki, o/c of Charles River, 1959. 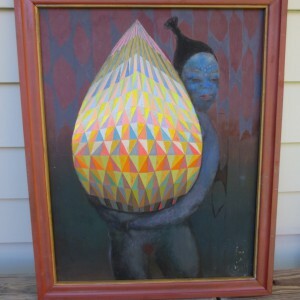 Kubicki, a little known New Hampshire artist who worked in the 1950’s thru 1970’s, painted in a variety of styles. 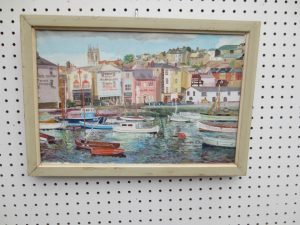 This painting is a part of a collection of his paintings (most of which were signed) found in his house after his death, and purchased from the new owners’ family. Painted in wonderful Pointilism style. Shows the diversity of this artist. Excellent condition. 12-1/4 x 20-3/4 inches. Martha Ernst. 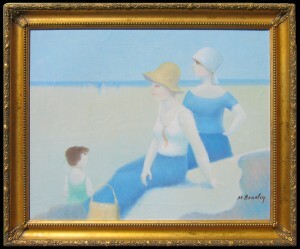 Two women on beach. Very striking. Oil on artist board. 1981. Original frame. 16 x 20 in.